A major part of my Augustine project over the past few months has been Peter Brown’s biography, which is generally viewed as the definitive longer, critical biography of Augustine. It was first published in 1967 (when Brown was 32! ), but was updated in 1999 with an epilogue exploring new evidence about Augustine’s life and new directions of interpretation in the field of Augustine (so its both stood the test of time and not too out-dated). I had very high expectations of this book, but after a careful read, I have to confess that I do not share the glowing admiration of all the Amazon reviews of this book. The book did have many fine qualities. Brown’s writing is skillful (I learned lots of new words, like “coquettish”  and “swingeing” ). His presentation is sophisticated and his interpretations are insightful and measured. He demonstrates a thorough knowledge of all things Augustine and engages many issues of scholarly interest pertaining to the field of Augustine. The shining strength of the book, in my opinion, is Brown’s knowledge of Augustine’s historical context. He paints a vivid picture of Roman African culture on the eve of the transition from antiquity to the middle ages. This was truly a fascinating world: one in the outer skirts of the more sophisticated regions of southern Europe, but still one with its own intelligentsia and theological trends. 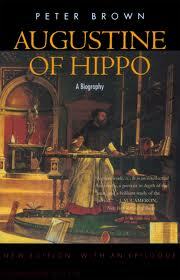 Augustine, like Tertullian, was thoroughly African, and its helpful to see a little bit of what this setting was like – the spiritual problems of the people of Hippo, the tensions between African bishops and those in Europe (especially in the East), various events I previously knew nothing about, like the Council of Carthage in 411, and so forth. All in all, however, I was disappointed. Time after time I would be nearing the end of a chapter, still waiting for the penny to drop, and finish by writing in the margin: “Brown isn’t really saying much.” I kept patiently plodding through, impressed with Brown’s skill and knowledge but wondering when Augustine the theologian would be emerge. It wasn’t until after I read all the way through the epilogue that I realized the problem: Brown is a historian, and his interests are the interests of a historian, not a philosopher or theologian. He himself admits as much in looking back 30 years later: “I prudently skirted Augustine the metaphysican, and limited my consideration of his theology largely to his notions of grace and of the Church” (495). What concerns Brown is to see Augustine in relation to his context, especially how his inner developments dovetail with the external developments of his time. But the book is not anchored in clear, over-arching interpretations that draw out Augustine’s overall significance for today, and it fails to adequately engage Augustine’s theology. There is virtually no treatment of Augustine on the problem of evil, or just war theory, or the nature of pride as the root of sin, and his more speculative works like De Trinitate or De Doctrina Christiana or his commentary of Genesis are neglected. Even his treatment of The City of God and Confessions seems largely driven by a-theological interests, such as Augustine’s internal emotional development and the transition from the classical to the medieval world. For someone like me who is drawn to Augustine primarily for his theology, this book simply failed to intersect with my interests. Of course, the book is still a very helpful resource for what it does aim to do, but I find it difficult to view it as “the standard account of Augustine’s life and teaching,” as claimed on the back cover, and reiterated through many of the 33 Amazon reviews. How can it be the standard account of Augustine’s life and teaching when its discussion of the latter is so filled with gaps? Instead, I would suggest that this book should be seen as a great resource for the understanding Augustine’s life, and especially the historical context in which he lived. That is my main benefit from this book. I now have a working knowledge of the basic details of Augustine’s life, and a sense of what it would have been like to live in Roman North Africa between the 380’s and 420’s, as the Roman Empire was beginning to crumble. But this is not the best book for someone wanting to engage with Augustine’s thought as well as his life. The other benefit I received from reading this book is that the way Brown looks back on his biography during the epilogue gave me insight into the nature of scholarship. I’ve never read a book where you have something like this – an old, established scholar openly critiquing major aspects of the book that put him on the academic map as a young man. Browns’ self-criticisms are not on minor points – several times he admits he got it completely backwards, and advocates an opposite view to the one he advocated before. Whereas formerly, for example, Brown had portrayed Augustine’s as harsh and authoritarian in the ecclesiastical disputes of his middle and later years, Brown now seems eager to vindicate Augustine – he sees more continuity in his development, and is no longer willing to interpret his doctrines of predestination and grace in terms of an alleged hardening during his bishopric. Whereas formerly Brown could treat Augustine’s view of sexuality dismissively and with some disdain, he now argues, against popular conception, that it was moderate and humane. He compares him favorably to contemporaries like Jerome, Gregory of Nyssa, and Ambrose, whose views were even harsher (they had no place for sexuality as a good part of life in the Garden before the fall), and suggests that the very vehemence of Augustine’s later writings against sexuality was to some extent the result of being accused of being too moderate (500ff.). I admire Brown for his honesty and for his passion for his subject. It was fascinating to see his life’s journey with Augustine, and it made me long to have a similar journey in my studies in Anselm. It also reminded me of how subjective and partial the basis is for so much scholarship: if so much change can happen in one person from the beginning to the end of his scholarly career, how much more can it happen on an entire topic, or in an entire field, over the course of time? And if a life-long Augustine scholar can still be changing his mind and learning new things at the end of his career, how much more – in Augustine and elsewhere – is there room for new discovery and insight? There is so much truth out there still to explore. I too am making a study project out of Augustine this year. Have you come across any good theological histories of Augustine that address what you wanted Brown to cover? I read David Bradshaw’s paper ‘Augustine the Metaphysician’ yesterday and I found it interesting. In it he addresses how Augustine’s prior philosophical commitments affected his theology, e.g. his views on predestination. It can be found in the book Orthodox Readings of Augustine. Interesting, Drew, I’d not heard of that before. Hope you are well, would love to hang again sometime.